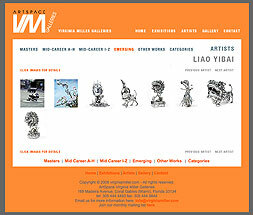 When asked where he grew up, Liao Yibai answers “Mailbox 5.” Born in the hospital of a top-secret chemical engineering factory that made missile propellants, Yibai attended the factory school, where he was told by his teachers that if he studied hard he could attend the Military Industry University and then work in the propellant factory like his parents. Yibai says that even as a boy, he swiftly rejected that career. “We would be studying in school, and there would be a loud boom,” he recalls. “Yesterday it was a factory building, and today it’s gone…”. Yibai decided that “I wouldn’t come back here to replace my father, even at gunpoint.” So that his son wouldn’t have to work at the factory, Yibai’s father taught him to paint so he could qualify to attend an art school.